The Three Crowns Mum of The Year is here again! To celebrate our 30th anniversary, we will be having not one but three mums of the year! Is she fit, Smart and supercool Mum? Then it’s time to nominate her as the next Three Crowns Mum of the Year. Three Crowns Milk is calling for nominations in the “2018 THREE CROWNS MUM OF THE YEAR” promotion in celebration of her 30TH ANNIVERSARY. Participants/Nominators should submit the picture of the empty packs of Three Crowns 380g pouch (1 unit), or Labels of Tin Evap 160g (4 Units) and fill the form. 3. Visit https://goo.gl/GhHcgN and upload your entry. 3. Visit our collating centers to nominate yourself or your mum. Nomination is not restricted to your biological mother, you can nominate anyone that is a mum such as your aunt, wife yourself and any mother that you think is fit, fun and smart to be the Three Crowns mum of the Year. Mothers can also nominate themselves. Entries that are incomplete, illegible, indecipherable will not be valid and deemed void. Participants will be required to buy 380g pouch (1 unit), or Four Evap 160g labels (4 Units) of Three Crowns Milk. Participants are expected to write a short story of why their ‘’mum/mother figure’’, or themselves as a mum is the best and deserves to win the grand prize”. 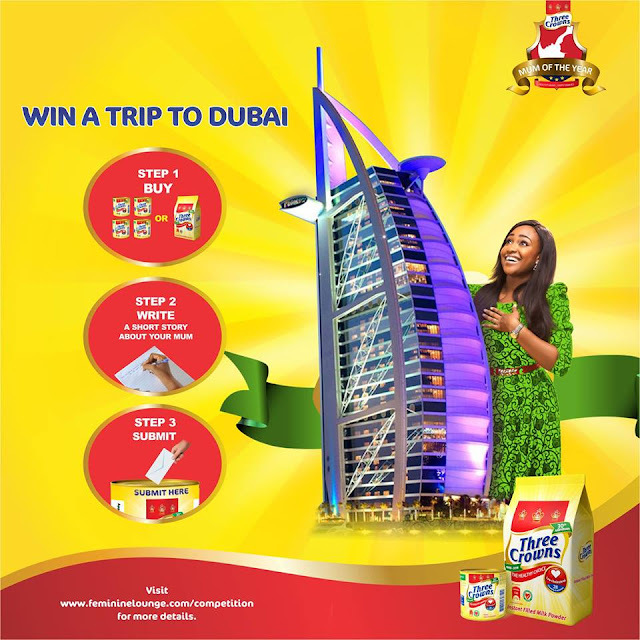 Participants should submit the picture of the empty packs of Three Crowns 380g pouch (1 unit), or Labels of Tin Evap 160g (4 Units) with their story, participant mobile number, mothers name, mothers location, mothers number and mother’s location to any selected collection centers near you or on the brand website www.femininelounge.com/competition. Valid entries will receive a one-off automated airtime credit upon submission of the entry. Confirmation of the airtime will be made via SMS containing to the entrants mobile phone numbers. In this three crown milk competition if I don't win it I will then know that is not real at all because I have so many people that choose me for it. I will really love to be one of the lucky winners ,I love the promo so much. Thanks.